Hanoi (VNA) - Vietnam will send seven young golfers, of average age 18, to take part in the upcoming Southeast Asian (SEA) Games in Malaysia. Four of them will compete in the games for the first time, including Doan Xuan Khue Minh, 14; Nguyen Hung Dung, 16; Hanako Kawasaki, 17; and Nguyen Phuong Toan, 18. They will compete alongside veterans Truong Chi Quan, 19, Do Le Gia Dat, 23, and Nguyen Thao My, 19. These young aces are expected to bring a breath of fresh air to the national team. Four of the young golfers represent the promising junior golf generation in Vietnam. Dung and Toan have been trained in prestigious golf institutes in the United States. Minh is training at the Leadbetter Golf Academy in Hanoi. 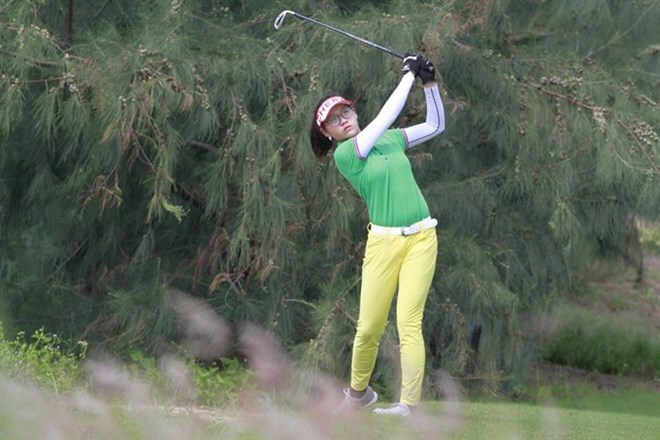 Meanwhile, Hanako, who has both Vietnamese and Japanese antecedents, has not been practising in any academies, but she is the defending champion at the national women’s golf tournament and Vietnam Junior Open. Earlier, Vietnamese sports authorities decided to select only golfers under 25 for the national team to compete in the games. Hanako has been named in the World Amateur Golf Ranking (WAGR). She is the second Vietnamese woman golfer to be named in the WAGR, behind Ngo Bao Nghi. “Hanako is one of Vietnam’s best woman golfers now. At the event in Malaysia, Hanako and My are expected to bring home medals for the women’s team,” said Hung. My is not an unknown name in Vietnamese golf. She competed in the SEA Games in Singapore two years ago and won the national women’s events in 2014 and 2015. In the Vietnam Junior Open (VJO) 2017, My ranked second in women’s Group E.
According to Hung, besides Hanako and My, Quan is also a medal hope for Vietnam in the men’s singles. Quan is a three-time national amateur champion in 2014-16. At the VJO this year, he took the lead in men’s Group E. At the SEA Games two years ago, he ranked 18 out of 34 players in the men’s singles. In the regional tournament, Thai players are arch rivals. They dominated in all the four categories — women’s and men’s singles and the team event in the previous games. Besides Thailand, Malaysia, Singapore and the Philippines are also strong teams. “In recent years, thanks to coaching in golf institutes, especially in the US, Vietnamese golfers’ achievements have improved, but there is still a gap in the standards displayed by Vietnamese and regional players. However, we hope that Vietnam will take a leap in the upcoming games,” Hung said. Minh, 14, is the youngest player in the Vietnam sport delegation at the upcoming games. Minh, who has played golf for three years, beat Tran Chieu Duong, national tournament silver medallist, during the selection to earn a slot to compete in the games. “I am very happy to take part in the regional event. I will try my best to have the best result at the event,” Minh said. According to coach Nguyen Huy Tien, who discovered Minh’s talent, Minh has good physical strength and skills. If she is invested carefully, she will be a leading player for the country in the future. To prepare for the games, the Vietnamese players have had an intensive training in Malaysia. Now they are training in Ho Chi Minh City, before leaving for Malaysia on August 19.